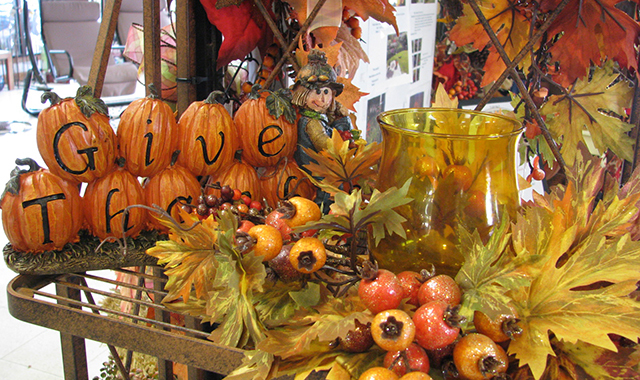 This year’s autumn decor incorporates whimsical sayings, distinct color palettes and natural elements, like this example seen at Countryside Flower Shop, Nursery & Garden Center, in Crystal Lake. As autumn rolls in, many families will find this season is a welcome opportunity to refresh the inside of the home, with decidedly fall tones or timeless new accent pieces. You can start anywhere: update your accessories, change out your furniture, add in floral arrangements, play with new draperies or throw pillows. Whatever you do, you’ll notice that design styles this year have several things in common: they’re simple, streamlined and often follow a certain color palette. When you think of fall colors, do you envision shades of burgundy, yellow and brown? Or do you think of blue skies, earth tones and pops of pinkish purple? While traditionalists may stick with the former list, those in tune with the Pantone “Color of the Year” will be more inclined to accept the second selection in their fall palette. The entire design industry – from those creating fabrics to those manufacturing refrigerators – look to Pantone for color direction, says Lynne Wickham, president of Wickham Interiors, 67 N. Williams St., in Crystal Lake, and a professional member of the American Society of Interior Designers for more than 25 years. When Pantone chose its 2016 color – actually two colors this year – the design industry saw the light-pink Rose Quartz and the light-blue Serenity explode in every market, from makeup to interior design. Now, as the leaves begin to turn, Pantone’s 2016 Fall Color Palette comes into play, and those pastel colors are segueing into richer tones. The palette is anchored by blues. One, called Riverside, is a deep, rich tone with a hint of gray and green, Wickham explains. The second, Airy Blue, is a transitional color, somewhere between Serenity and Riverside. Rose Quartz, meanwhile, has been transformed into two shades of red: Dusty Cedar, a rusty coral that’s a bit rosier than Rose Quartz, and Aurora Red, a bright, almost rusty color that echoes classic autumn hues. This fall, designers are also turning to neutrals in Sharkskin (gray) and Warm Taupe; traditional fall colors in Spicy Mustard (yellow) and Potter’s Clay (reddish brown); and pops of color in Lush Meadow (green/teal) and Bodacious (purple). Why should you care what the fall color palette entails? Understanding what the industry has chosen as a trend will help you to understand the products you’ll find when you’re trying to decorate your home. Wickham helps clients to stay current by taking colors they like and transforming them into workable color combinations, mixing neutrals with bolder choices that can outlast the current fad. Fortunately, the latest trends toward blues, whites and golds are very livable. Good designers note the trends but also pay attention to social elements that affect how people feel, thereby determining how they decorate their homes. They’re also afraid of making commitments, she says, which is why gray tones have been so popular the past few years. The neutral color is a sign of non-commitment. But Wickham sees indications that change is coming. Interestingly, Benjamin Moore’s color of the year is Simply White, a neutral that can soften a bold blue. “It reflects non-commitment, but people want freshness and something that everything goes with,” Wickham says. Brass and gold, once touted as old-fashioned, are returning to fixture designs. Last year, the design industry started mixing nickels and brasses as a transition from silver and chrome finishes. But this year, brass and gold are the hottest choice. Gold is even being picked up in wall coverings, emphasized by Metallic Gold being the color of the year for York Wallcoverings, an industry leader in color and design. The color is also found in animal, Bohemian and tribal prints, which are still popular, despite the trend toward simple patterns. Look for more patterns like damasks, an intricate wavy pattern, that’s being mixed into solid-colored materials. The solid color tones down the busy pattern, but the texture still gives it some life, Wickham says. Window coverings are becoming more simplified as well, with sheers and drawn draperies replacing hard treatments like shades. Culturally, simple has become a new coping mechanism. If trendy colors aren’t really your style, an easy way to transition to fall decor is to utilize flowers and fall foliage It’s a decorating tip that’s often overlooked, says Amanda Nicolai, a floral designer who’s worked for 16 years at Countryside Flower Shop, Nursery and Garden Center, 5301 E. Terra Cotta Ave., in Crystal Lake. “Other than your typical Thanksgiving centerpieces, whether it be fresh or permanent botanicals, we really don’t see a lot going into the homes for fall, which is sad, because it’s such a beautiful time of year,” Nicolai says. Traditional centerpieces can be used throughout the fall season, not just at Thanksgiving, and can often include silk flower arrangements in standard fall tones such as burgundies, bronzes and golden yellows. Lately, designers have also been mixing in dried products like glycerin oak leaves, cattails and wheat. In some cases, you’ll also see those fall items arranged with acorns and displayed in mason jars, anchored with coffee beans on the bottom for a rich-smelling and lovely looking tablescape. Add succulents into mason jars to bring in more fall color, Nicolai says. Or, plant these small houseplants into a hollowed-out log to create a centerpiece. At the same time, a round, inch-thick slab of tree trunk can introduce texture to a space. They’re perfect for candle bases. If you’re looking for that earthy look, stick with natural browns and creams, and a lot of bark and texture, Nicolai advises. It’s not necessarily a woodsy look, but a true organic feel that people are going for. As a gift store, Out of the Box, 71 N. Williams St., in Crystal Lake, follows trends closely. Owner Mary Batson sees people drawn more to natural wood, galvanized metal and burlap, the latter of which has been trending for a while. “Any of those things in combination seem to grab people’s attention as well, like wood frames with burlap or metal detailing,” says Batson. Years ago, people referred to the style as “shabby chic,” but that idea has morphed into more of a natural look, with clean, simple lines, she says. The trend, which some have coined “rustic chic,” is largely connected with people being fiscally responsible and socially conscious. Reclaimed wood, for instance, is extremely popular. Batson finds that customers aren’t looking so much for bold colors as they are for whites with a little trim. In part, that’s because a neutral-toned gift is usually better received than a bold statement piece, Batson says. Neutrals tend to work better with existing décor, and they have the added benefit of inspiring nostalgia. Keeping with that trend, popular artists such as Kelly Rae Roberts, who’s known for her bright, bold colors, have muted their palettes in favor of softer tones, Batson says. Bob Wozniak, owner of Strode’s Furniture, 11707 Main St., in Huntley, sees a growing interest in dining room sets and upholstery during the fall, as families ready their homes for holiday meals and extra guests. His sales are mirroring many of the popular trends in home decor. He’s seen the re-introduction of blue tones in upholstery, but with calls for darker tones or medium, almost seafoam hues. Red tones are popular, too, year-round. Bulky-armed furniture is out, as customers look for streamlined track arms – or straight, flat arms. The woodsy, organic look is also making itself apparent in furniture, through a style referred to as “living edges.” Such pieces retain some of the tree’s bark, often at the edges of the furniture, where it’s sanded just enough to take off the rough patches. Then, the edge is finished. This living edges look has been popular in dining room tables, says Wozniak, and it now making its way into dressers, chests and other products. Traditional, finished furniture pieces are being stained darker rather than lighter, and more pieces are being made out of cherry and maple woods. Grey elm is growing in popularity, too. It looks like teak, a tropical hardwood, but it’s grown in northern Michigan or northern Wisconsin, Wozniak says. Though the look of furniture is changing, one trend that hasn’t changed is quality. If you want to liven things up for the fall there are plenty of simple, inexpensive tricks that can transform a room. Decorative candles and/or votive holders – placed on a table, kitchen counter or bathroom vanity – can make a room feel like it was completely refreshed, Batson says. Adding or changing out wall plaques to fit the season is easy, too. Likewise, changing out the framed pictures on your wall, or grouping them differently, can create a new focal point in a room, says Wickham. An easy way to decorate for autumn is to select accessories that associate with fall but also works year-round. Leaf shapes, for example, can be used throughout the year, Wickham says. A napkin ring with a leaf print can look spring-like when paired with pastel colors, but it can take on a definitive autumn theme with darker cloth napkins. Accent pillows can quickly change the look of your furniture. Most of the fabrics Wozniak sells in upholstery are solids and tweeds meant for the bodies of chairs and sofas. Try matching these more traditional patterns with pillows covered in trendy prints, which can be swapped out to match the new season. It’s also not a bad idea to fuse the inside of your home with the outside. Growing pumpkins or gourds doesn’t take up as much space as people think, Nicolai says. Because they’re vines, pumpkins can be grown on a trellise to take up less ground space. Once the fruits have matured, they can be harvested and brought inside for decoration. Planting a perennial cutting garden can produce additional bouquets for the home, Nicolai says. Certain daisies, black-eyed Susans and mums all bloom in fall and are ideal for inside arrangements. Keep in mind that not all “money-saving tricks” really save money. If you think that reupholstering a piece of furniture is a cost-effective alternative to buying a new item, make sure to talk to your upholsterer first. Often, such a project can cost a client as much as or more than a replacement piece, Wozniak says. However you decide to decorate your home this fall, remember that a few simple touches can make a big difference. Upholstery, accessories and floral arrangements are just a few ways to add a little autumn spice. This entry was posted on Monday, October 10th, 2016 at 12:00 pm	and is filed under Home & Garden, Top Posts. You can follow any responses to this entry through the RSS 2.0 feed. Both comments and pings are currently closed.